Home • News • Hundreds complete bubbly 5k for Rowcroft! Hundreds complete bubbly 5k for Rowcroft! Hundreds of families slid, skipped and toddled their way around the Bay’s bubbliest 5k today, as Rowcroft Hospice’s Bubble Rush burst into Torbay Velopark. 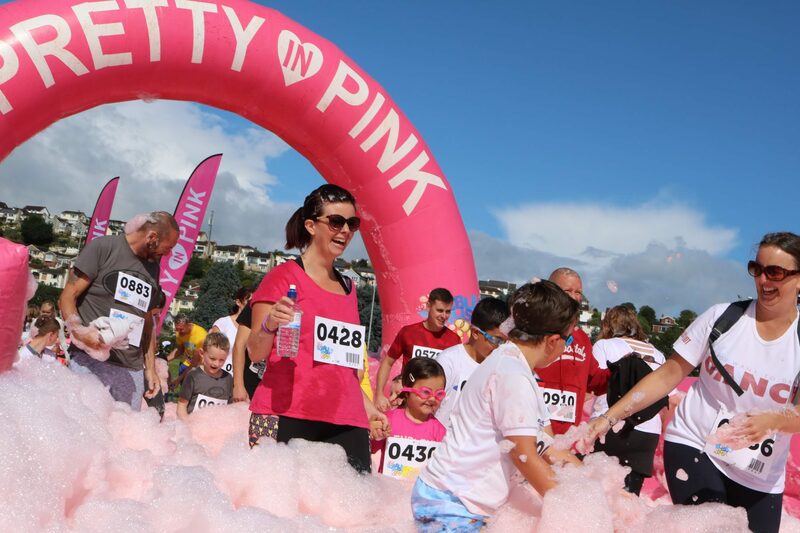 The fun run with a difference saw more than 900 people complete three loops of Torbay Velopark’s track, while getting showered in thousands of multi-coloured bubbles. Rowcroft hopes the event will have raised more than £35,000 to help support local families living with life-limiting illnesses. Claire Johnson from Newton Abbot and her 12-year-old daughter, Tegan Fletcher, also took part in memory of Tegan’s Grandad. Organisers of Rowcroft’s inaugural bubblicious event say they are delighted with the amount raised. Daniel Robson, Rowcroft’s Events Manager added: “I would like to say a huge thank you, on behalf of all at Rowcroft Hospice, to all those hundreds of people and families who went to such fantastic efforts to raise funds for Rowcroft Hospice today! Rowcroft’s packed events calendar continues next month with 24km cycle challenge, Ride for Rowcroft, taking place at Newton Abbot Racecourse on Sunday 8 October.